Properties in Giarre average 4.6 out of 5 stars. 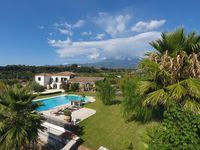 Charming villa with PRIVATE POOL, blossoming garden and sea & Etna views. Property 6: Charming villa with PRIVATE POOL, blossoming garden and sea & Etna views. Beautifull villa between Etna and Taormina sea-cost. Stunning view. 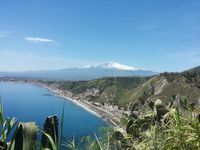 Property 10: Beautifull villa between Etna and Taormina sea-cost. Stunning view. Casa di Valentino apartment in Giarre with WiFi, integrated air conditioning, balcony & jacuzzi. Property 14: Casa di Valentino apartment in Giarre with WiFi, integrated air conditioning, balcony & jacuzzi. "Atelier", ancient Sicilian vintage home the slopes of Etna, the sea 4 Km. Property 18: "Atelier", ancient Sicilian vintage home the slopes of Etna, the sea 4 Km. Up to 6 guests- SwimmingPool- BBQ- garden- parking- Wi-Fi by "SunTripSicily"
Property 22: Up to 6 guests- SwimmingPool- BBQ- garden- parking- Wi-Fi by "SunTripSicily"
We had a great stay at the villa. The pool is certainly the most amazing feature and is well connected with outdoor wifi, outlets, etc. AC worked well and any issues were promptly handled by the owner. Chef service was excellent. Would recommend overall. Fantastic Experience. The accommodations were exactly as described and met our needs perfectly. Giovanna was very friendly and thought of all the little touches to help us out during our stay (where to eat, buy groceries, instructions on how to use the TV, A/C, etc.) Even a welcome basket with some food was totally unexpected and very appreciated. Highly recommended, would definitely stay again.